"Stale" redirects here. For the village, see Stale, Poland. Staling is not, as is commonly believed, simply a drying-out process due to evaporation. Bread will stale even in a moist environment, and stales most rapidly at temperatures just above freezing. Bread stored in the refrigerator will have increased staling rates, and therefore bread should be kept at room temperature. However, refrigeration delays the growth of mold and extends the shelf life of bread. One important mechanism is the migration of moisture from the starch granules into the interstitial spaces, degelatinizing the starch. The starch amylose and amylopectin molecules realign themselves causing recrystalisation. This results in stale bread's leathery, hard texture. Additionally, pleasant "fresh" flavor is lost to the air, and often unpleasant flavor is absorbed from it as well, especially in a confined space with other food such as when in a refrigerator. Anti-staling agents used in bread include wheat gluten, enzymes, and glycerolipids, mainly monoglycerides and diglycerides. Stale bread is an important ingredient in many dishes, some of which were invented for the express purpose of using up otherwise unpalatable stale bread. Examples include bread sauce, bread dumplings, and flummadiddle, an early American savoury pudding. A sweet dish is bread pudding. There are many types of bread soups such as gazpacho (in Spanish cuisine), wodzionka (in Silesian cuisine), ribollita (in Italian cuisine). 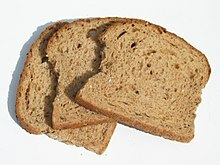 Stale bread can be used to "stretch" meat in dishes such as haslet (a type of meatloaf in American cuisine) and garbure (a stew in French cuisine). It can be a subsidiary ingredient in dishes such as fattoush (a type of salad in Levantine cuisine). Stale bread can be used as a base for dips such as skordalia (in Greek cuisine), or substituted with another ingredient. Cubes of stale bread can be dipped in cheese fondue, or seasoned and baked in the oven to become croutons, suitable for scattering in salads or on top of soups. Slices of stale bread soaked in an egg and milk mixture and then fried turn into French toast (known in French as pain perdu - lost bread). Sometimes the same word can have different meanings in different countries. Migas, in Spanish and Portuguese cuisines, is a breakfast dish using stale bread, and leblebi, in Tunisian cuisine, is a soup of chickpeas and stale bread. In medieval cuisine, slices of stale bread, called trenchers, were used instead of plates. Stale bread can be partially destaled by heating to 60 °C (140 °F) in a conventional oven or microwave oven. However, if not eaten before it cools or dries, the bread is even worse than before due to the moisture loss. ^ McGee, Harold (2004). On Food and Cooking: The Science and Lore of the Kitchen (2nd ed.). New York: Scribner. ISBN 0-684-80001-2. Look up staling in Wiktionary, the free dictionary. Xie, Feng (1998). The study of bread staling using visible and near-infrared reflectance spectroscopy (PDF) (Ph.D.). Kansas State University. Retrieved 2014-08-25. This page was last edited on 2 February 2019, at 02:08 (UTC).